On October 4, the Jesuit Alumni and Friends host another luncheon about a pressing current issue, with guest speaker Fr. Tom Smolich, SJ, head of the Jesuit Refugee Service. His talk about this Jesuit ministry, operating in 53 countries around the world, will focus on JRS’s work in reconciliation and education, its foundation in Ignatian spirituality, and what JRS means for us here in the USA. Find more information and register at www.jesuitsmidwest.org/JAFDFall18. Part of our parish mission is to be “a church for the city.” One way we do that is to connect with major events in the city as we did with the Jazz Festival. We are going to try another such connection – with the Free Press Marathon. 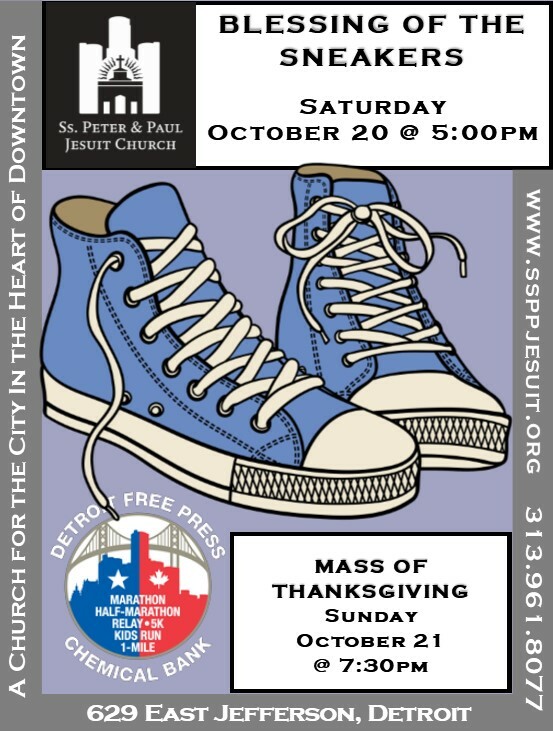 Taking a cue from the Boston race, Ss Peter and Paul will host a Blessing of the Sneakers on Saturday, Oct 20, and a Mass of Thanksgiving following the race on Sunday, Oct. 21. Early November will bring a video learning experience from the Archdiocese. And plan now for our men’s retreat at Manresa (Nov 2-4), and the women’s retreat (Nov 9-11). Finally, let us celebrate with gratitude and continue to pray for those who are wonderful signs of new Life in our midst. 3 task forces of parishioners are exploring possible new social justice initiatives for our parish. 5 young adults are beginning their exploration of the Catholic faith through our Christian Initiation process, and another 17 young adults have enrolled in the second cohort of our 2-year Ignatian leadership development program. Thanks be to God! Young Adults – THIS WEEKEND-Sept 9th!! After our 7:30PM mass we'll have our monthly young adult social gathering. This time will include Wine and Cheese in the courtyard, along with some fun activities. See you there! Join our choir! Our SSPP choir is looking for new singers, and we invite you to join us! We sing each Sunday morning at the 11:00 am mass, September through June. (It's okay if you miss a few Sundays here and there... we're very accommodating!) We warm up before mass, and then on most Sundays we have a rehearsal after mass. More than just being a musical group, our choir is a family. We laugh together, pray together, and offer support to one another in times of need. The SSPP choir will begin the season with a choir retreat on Saturday September 8. We spend the morning and afternoon getting a head-start on music for the year, and reconnecting with one another as a team. We are also always seeking musicians to add to the leadership team at the 7:30 pm mass. Are you interested in joining us? Contact Julie Ford, or stop by the piano after any mass and chat in person. RSVPs are required for the choir retreat. Help fill our beautiful red welcome bags. Flexible dates and times! Supply us with coupons, take out menus or promotional pieces from area businesses and organizations. Help deliver the finished bags to new residents in the area. Please contact the office if you are able to help with this important ministry. Time to tap into your inner Picasso! 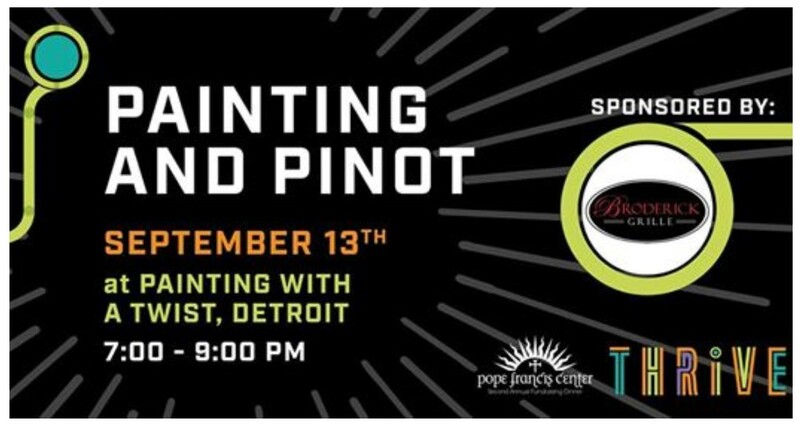 Join in "Painting and Pinot" night to benefit The Pope Francis Center. Registration is $35 and includes a two-hour painting lesson, as well as some fine vintages from Broderick's Grille and fantastic snacks. 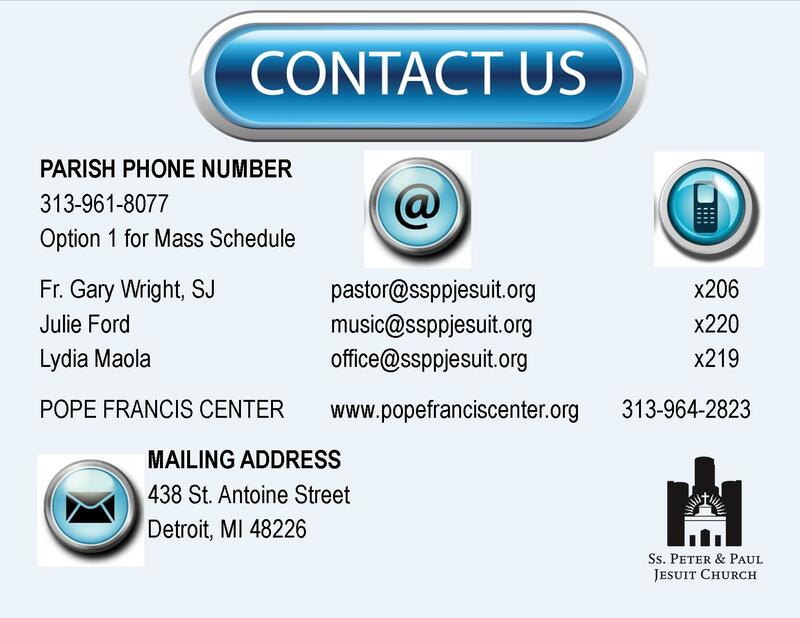 For more information click on www.popefranciscenter.org.